[Vadim Rudakov, labeled a Golden Horde expert] came away from the first meeting feeling enthusiastic that Russia would “finally” have an accurate depiction of life under its Mongol forbearers, who are widely credited with establishing regional government, a postal system, census-taking, and military organization. But once the script was developed, Rudakov was crestfallen. Most of his suggestions about historical accuracy had been ignored, he told RFE/RL. And the depiction of the Mongols, he said, was deeply degrading. “Some of them were given human qualities, but the overall impression is of brutal, bloodthirsty, evil-minded, greedy people. Even the jokes they told were flat and stupid,” Rudakov says. “It was all of the worst traditions of the old Soviet films about Tatar Mongols and nomads. Reactions to this debate have been predictable: films, we’re told, can change what they like to be entertaining (or, if Google translate can be trusted, it’s actually quite accurate); authentic Russians should celebrate breaking the Mongol yoke; Russians should be proud of Russia; and something to do with whether the Ukraine as such ever existed (in comments) and whatever the comment at September 21, 2012 08:48 could possibly mean (“CIS nations are not ‘Indians’ as Russian Neanderthals saying, Their nations emerged Caucasians long before came Varaga. Varaga were Neanderthals, only since fifth Century BC mixing With Sam-Gad corsed tribes”). I’m particularly interested in how The Horde uses food to delineate human from subhuman. 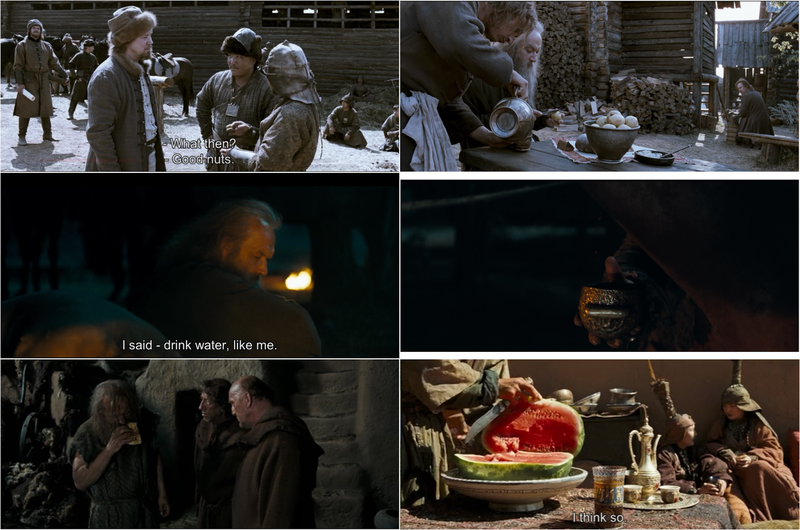 In it, the ‘good guys’, i.e., the Christians, don’t eat meat: they eat turnips, bread, and nuts and drink only water; the ‘bad guys,’ i.e., the Mongols, eat roasted meat, drink strong liquor and horseblood, and, at one point, scarf a watermelon, whose red dripping ‘flesh’ surely is meant to resemble meat. Of course, the Mongols have already eaten people; so they are, of course, a people possessed, more beast than human. Food divisions like these would be perfectly expected had this film been written in 1240 by, say, Matthew Paris. “Thirsting after and drinking blood, and tearing the flesh of dogs and human beings,” the Mongols swarm “like locusts,” writes Matthew, joining with the 1238 Chronicle of Novgorod, whose Mongols “eat the flesh of the strong, and drink the blood of the Boyars,” and Yvo (or “Ivo”) of Narbonne in 1243, where the Mongols eat their victims “like bread.” I quote all this from Kim M. Phillips’s Before Orientalism, 91, but I just as well might have plucked it from Shirin Khanmohamadi’s In Light of Another’s Word: European Ethnography in the Middle Ages, 60. Phillips observes that since no one else accused the Mongols of anthropophagy, it’s unlikely that they ate people with any regularity. Rather, as both Khanmohamadi and Phillips observe, these accusations are just elements of the “barbarian topos,” common since at least the classical era (key examples, here and here), the same fevered depictions of the other we’re likely to encounter anywhere (trigger alert). Notably, the records of Mongol eating change as Christian missionaries produced better and better ethnography. When William of Rubruck writes that the Mongols have many “little creatures…which are good to eat, and which they are quite able to tell apart,” he may be a bit disgusted, but he at least has to admit they have a cuisine. And during his time among the Mongols, he himself comes to like kumis, a slightly boozy potable made from fermented mare’s milk. Using these and other, similar texts, Khanmohamadi and Phillips each argue that the ethnography of 13th and early 14th-century Latin Christendom, at least for Central and East Asia, can’t be typified as “orientalist.” Their argument doesn’t snipe at Said; rather, as they argue, the colonial conditions Said studied simply don’t apply to this period and the relationships between these regions. Latin Christians couldn’t colonize or conquer Central Asia (as for East Asia, it was almost literally off the map). Instead, the Latin Christian writers Khanmohamadi and Phillips treat feared Mongol conquest (or hoped to convert the Mongols to ally against a common Islamic foe); they correctly thought China superior in nearly every way, in matters of culture, artistic skill, in the glory of their cities and the virtue of their women, in just about everything — stupidly — but food. None of the Christian travelers in Khanmohamadi and Phillips would have produced anything like The Horde. They probably wouldn’t have portrayed Queen Taidula as the film did, as a dragon lady mastering her childish son: medieval misogyny has its own, probably less racist features. Furthermore, none would thought so highly of their own eating: none thought that Christians in general ate like the legendary Brahmans, on only roots (like turnips), nuts, and water. For all that, the film still contains what may be the seed of a small critique of Khanmohamadi and Phillips. The film misconstrues both Mongol culture and what I know (which isn’t much) about the “contact zone” of Christian and Mongol (“Russian” and Mongol?) encounters and interchange in the 14th century. 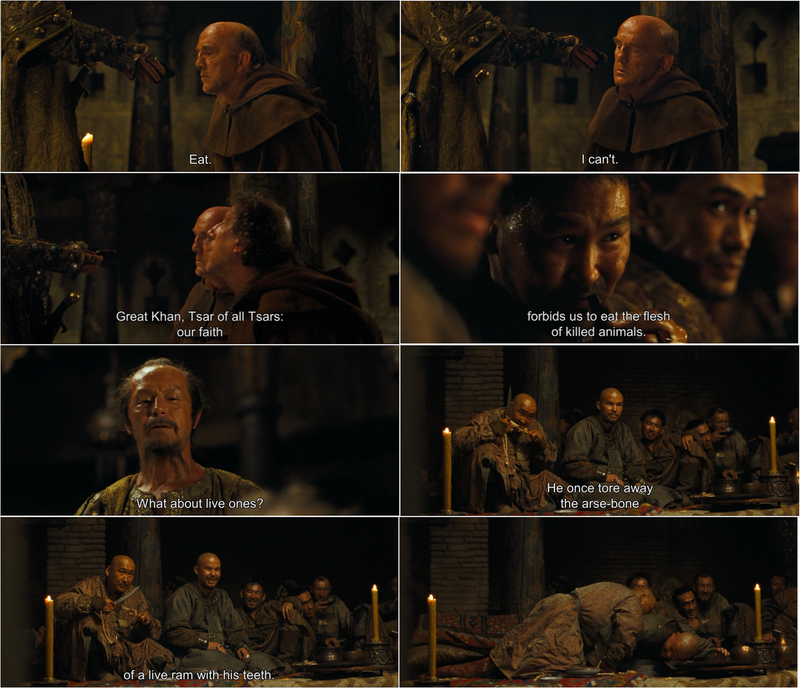 The film chooses the worst over the best medieval ethnography to portray the Mongols as lawless, uncivilized, cruel to animals, and somehow even more fleshy than Christians, because they eat little but flesh. Yet this portrayal isn’t quite Orientalized either. After all, the Christians in The Horde could hardly be more ignorant about the Mongols; they barely speak the language; they can only guess at Mongol history; there’s no certainty that the Mongols represent the living past of Christianity (that position, rather, was mostly reserved for the Jews, “living letters of the law”): there’s no Foucauldian Power/Knowledge at work here. What the Christians feel, primarily, is threatened by a lawless and violent enemy of civilization. What they feel, in other words, is what “the West” feels in what may now be a post-Orientalist time, when the West longs melancholically and guiltily for its former dominance over “the East” and everywhere else, and when the West knows the East only as an implacable and incomprehensible enemy. The Horde must be read in light of Chechnya. Or at least as a kind of anti-foundation myth, where Russia, as such, emerges only when its illegitimate rulers finally collapse. For more on the Mongols at this site, see this 2011 post here. See also this 2006 (!) post on meat-eating and masculinity. Elsewhere, see this superb recent post on veganism and hospitality, by Rebekah Sinclair at An und für sich; and enjoy this picture of Mongols eating, here. And for the food aversion and modern racism, see, for example, this.